These three colorful rubber fish all measure 3 3/4 long X 2 3/8" wide X 2 1/4" high with a custom imprintable are of 7/8" wide X 3/8". Minimum imprintable quantity is 50 and these fiah all squeak and are balanced for floating. Here are two more rubber fishes that are also the same size as the three fish above which is 3 3/4" long X 2 3/8" wide X 2 1/4" high and the custom imprintable area of 7/8" X 3/8". Minimum imprintable quantty is 50 and the fish squeak and are balanced for floating. The three fish on the left and you go can choose from Red, Orange, Yellow or Purple and the size of each fish 3 3/4" long X 1 1/4" wide X 2" high. The imprintable area on each fish is 7/8" wide X 5/16" high The larger fish on the right measures 3 1/4" long X 2 1/2" wide X 2 1/2" high and the imprint area is 7/8" wide X 3/8" high.. 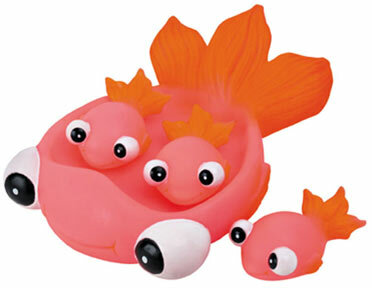 Minimum imprintable quantity is 50 and all of thes rubber fishes squeak and are balanced for floating. The Green fish on the left measures 6" long X 2 3/4" wide X 3 1/4" high with an imprint area of 1 1/8" wide X 7/16" high. The far right picture the Big Rubber Fish measures 6 1/4" X 4 1/4" wide X 5 1/4" high and the imprint area is 1 1/4" wide X 1/2" high. 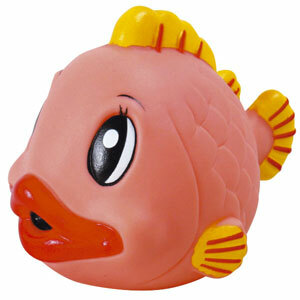 Both of these fish squeak. 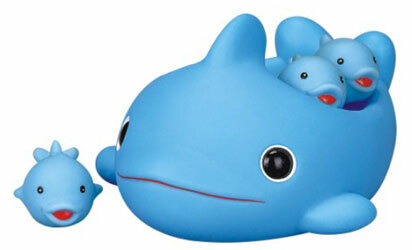 On the left is the rubber Dolphin small size Family. 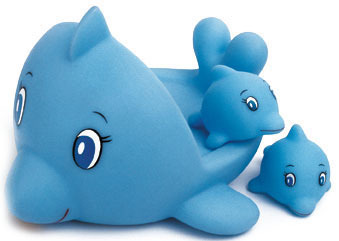 The large dolphin measures 5 1/2" long X 4 1/2" wide X 2 3/4" high and the small Baby dolphins are 1 7/8" long X 1 1/4" high X 1" high. The imprint area on the large dolphin is 1 1/8" wide X 3/8" high and the imprint area on the small dolphins is 1/2" wide x 1/4" high. The light blue dolphin on the right measures 5 3/8" long X 4" wide X 3" high and the imprint area is 1" wide X 1/2" high. The dolphins are balanced for floating. Minimum order on either of these dolphins is 50. Pictured below is a rubber Dolphin Family with one Mom and three Baby Dolphins. The Mom measures 7" long X 6 1/2" wide X 4 3/4" high with an imprint area of 1 1/4" wide X 1/2" eigh. Each of the babies measure 2 1/2" long X 2" wide X 1 5/8" high with an imprint area of 1/2" wide X 1/4" high. 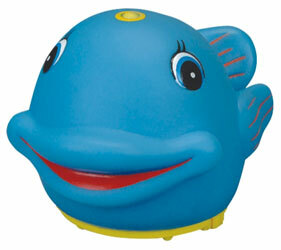 It squeaks and is balanced for floating. Minimum order is 50. 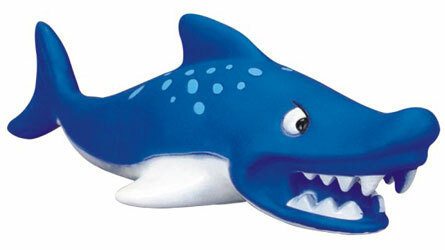 The rubber Big Teeth Shark measures 7 3/4" long X 3" wide X 2 1/4" high and the imprintable area is 1" wide X 3/8" high. 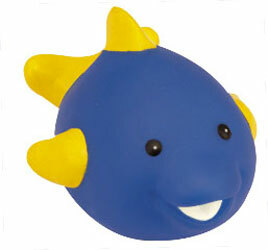 It is balanced and weighted for floating and squeaks. Minimum order is 50. 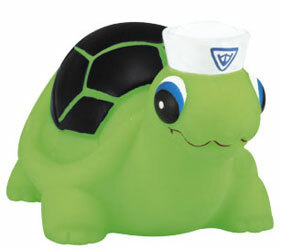 Pictured below is our Turtles that squirt water out of their mouth. 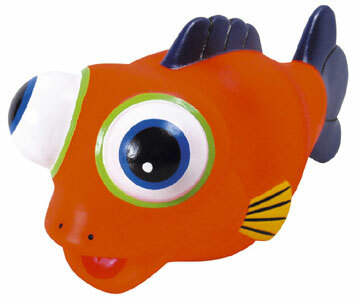 This fun-filled product measures 3 3/4" long X 2 1/2" wide X 2" high and the imprint are is 3/4" wide X 3/8" high. Minimum order is 50. Our squirting Baby Shark also squirts water out of its mouth and measures 2 1/2" long X 2 1/8" wide X 1 7/8" high and provides an imprintable area of 7/8" wide X 1/2: high. 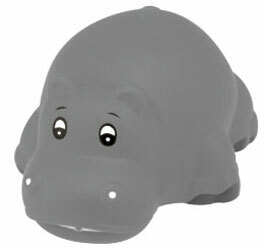 The Baby Hippo on the right also squirts water out of mouth and it is 2 7/8" long X 2 1/4" wide X 1 1/2" high. The imprintable area is 3/4" wide X 1/2" gh. Minimum order on either product is 50. On the left is the Squirting MouthWhale is 3 1/4" long X 2 1/2" wide X 2" high and the imprintable area is 7/8" wide X 1/2" high. On the right is the larger Rubber Squirting Whale that measures 5 1/4" long X 4" wide X 3 1/2" high with an imprint area of 1 1/4" wide X 1/2" high. 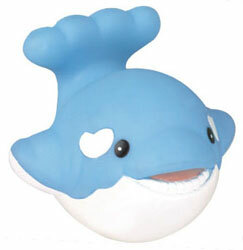 Flick the battery driven switch and this whale will squirt water for hours. Minimum quantity is 50. 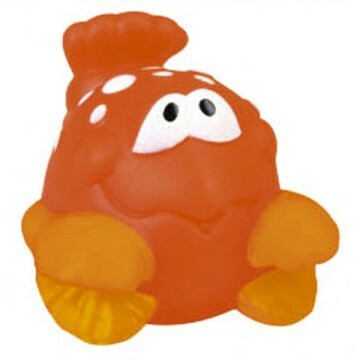 Both the Squirting Crab and the Squirting Lobster have built in batteries that will allow them to squirt water thru their mouth continiously for several hours. 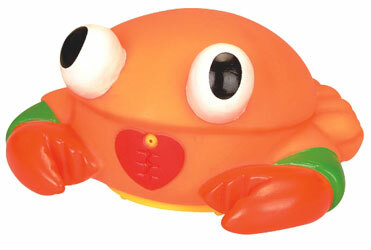 The Squirting Crab on the left is 5 1/4" long X 4 1/2" wide X 2 3/4" high and the imprint area is 1 1/4" wide X 1/2" high. 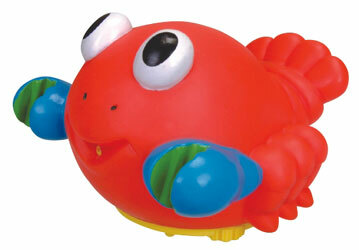 The Squirting Lobster is 5 1/4" long X 5" wide X 3 1/2" high and the imprintable area is 1 1/4" wide X 1/2" high. Minimum quantity on either of these is 50. 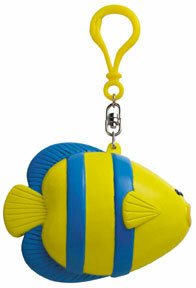 The colorful Fin fish are 6 1/8" long X 2 1/2" wide X 3 5/8" high and their imprintable area is 1" wide X 3/8" high. 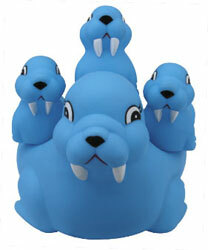 They squeak and are balanced for floating. Minimum order is 50. On the left the Goldfish Family consisting of Mom and three Babies with Mom being 8 1/2" long X 5 5/8" wide X 3 1/4" high with an imprint area of 1 1/4" wide X 1/2" high. The Babies are 3 1/4" long X 2" wide X 1" high and their imprint area is 9/16" wide X 3/8" high.On the right the rubber Gold Fish is 2 3/4" long X 2 1/4" wide X 3 1/8" high with an imprint area of 3/4" wide X 3/8" high. Both of these products squeak and float. Minimum order is 50. 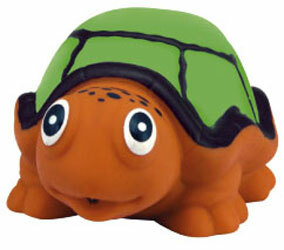 The Big Rubber Turtle is 5 3/4" long X 3 3/4" wide X 3" high and the imprintable area is 1 1/8" wide X 1/2" high. 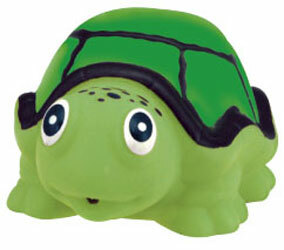 This is a squeaking turtle. Minimum quantity is 50. 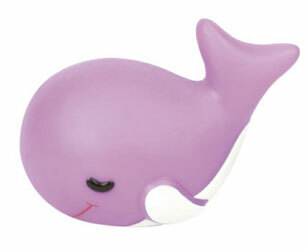 The purple rubber Whale is 3 3/4" long X 2 3/4" wide X 2 1/2" high and the imprint area is 1 1/8" wide X 1/2" high. 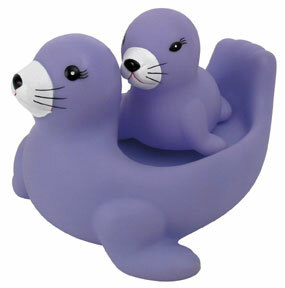 The rubber Sea Lion on the left is 3 1/2" long X 3" wide X 3 5/8" high and the imprint area is 1" wide X 1/2" high. They are balanced and weighted and float. 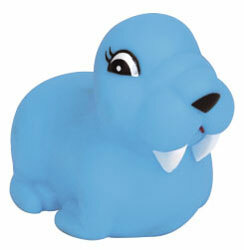 The blue Sea Lion on the right is 3" long X 1 3/4" wide X 2 3/4" high and the imprintable area is 1 3/16" wide X 3/8" high. Miimum quantity on either of these products is 50. On the left the rubber Sea Lion Family measures for the large sea lion 8" long X 5" wide X 4 1/2" high and its imprint area is 1 3/4" wide X 1 1/2" high. 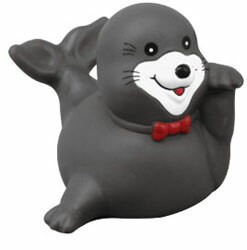 The smaller sea lions are 3" lofg X 1 3/4" wide X 2 1/2" high and their imprint area is 5/8" wide X 3/8" high. On the right is the Purplr Sea Lion with one Mom and 1 Baby. The Mom is 6 1/2" long X 5 5/8" wide X 4 1/8" high and the imprint area is 1 1/4" wide X 1/2" high. The Baby is 3 1/4" long X 2 5/8" wide X 3" high and the imprint area is 7/8" wide X 3'8" high. These are balanced for floating and squeak. Minimum order in either is 50. 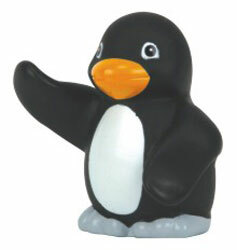 On the left is the Chubby Tubby Penquin that is a rubber squeaking toy. It measures 2 1/2" long X 3" wide X 4 3/4" high and the imprint area is 7/8" wide X 1/2" high. On the right is the Baby Penquin. It is 2 5/8" long X 2 3/4" wide X 2 3/4" high and the imprint area is 1/2" wide X 3/8" high. Minimum quantity is 50. 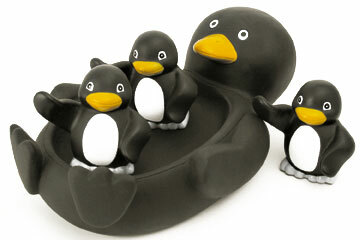 The rubber Penquin Family consists of the Mom and three Baby penquins. The Mom is 8" long X 4 1/4" wide X 2 1/2" high and the imprint area is 1 1/4" wide X 1/2" high. The Baby Penquins are 2 1/2" long X 1 1/2" wide X 1" high and the imprint area is 9/16" wide X 3/8" high. 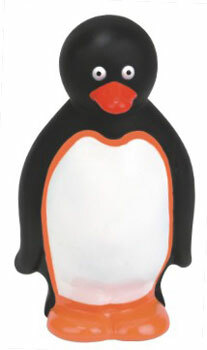 These penquins all sqeak.Minimum order is 50. 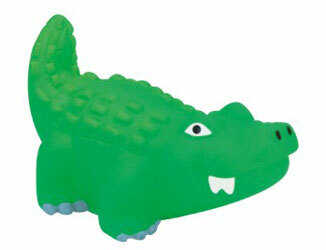 The rubber Crocodile is 3" long X 4 7/8" wide X 2" high and the imprint area is 1" wide X 1/4" high. Minimum order is 50. On the left is the Rubber Alligator Family with the Mom measuring 8 1/2" long X 5 3/8" wide X 3" high and providing an imprint area of 1 1/4" wide X 1/2: high. Each of the three Baby Alligators measure 3 1/4" long X 1 7/8" wide X 1 1/2" high and they have an imprint area of 5/8" wide X 1/4" high. 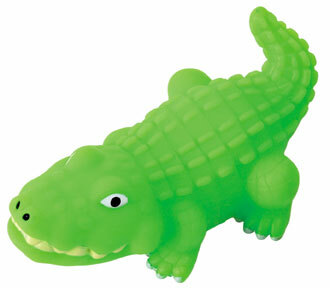 On the right is the rubber Alligator that measures 5" long X 3" wide X 2" high with an imprint area of 1" wide X 1/4" high. 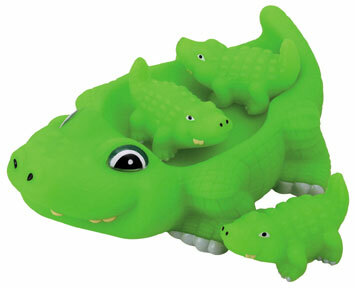 Both of these alligators float and alo squeak. Minimum order is 50. The Big Eyes Fish is 6" long X 2 3/4" wide X 3 1/4" high and the imprint area is 1 1/8" wide X 3/8" high. 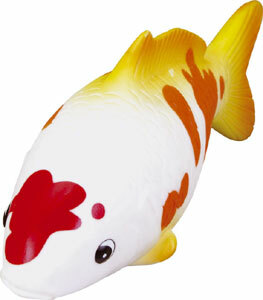 The Koi Fish is 7 1/2" long X 2 1/8" wide X 3" high and the imprint area is 1 1/8" wide X 3/8" high. Both of these float and squeak. Minimim order is 50. On the left is the Rubber Fish Coin Purse with Keychain and it measures 3 1/4" long X 2 7/8" wide X 1" high with an imprint area of 1" wide X 3/8" high. On the right the Rubber Octopus Coin Purse with Key Chain is 3 5/8" long X 2 5/8" wide X 1" high and the imprint area is 1" wide X 3/8" high. Minimum order is 50 of either of these products. The rubber Lobster is 3 1/4" long X 2 5/8" wide X 2 1/4" highand the imprint area is 5/8" wide X 3/8"" high. 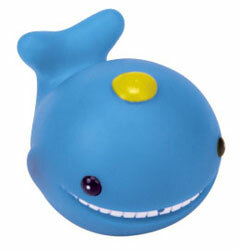 It is balanced for floating and squeaks. Minimum order is 50.